Examining the parts of music, and the combining of those parts, is a study called Music Theory. A person studies Music Theory rather than Music Law because art is flexible and laced with exceptions. Nothing stops the composer or improvising musician from bending the conventions of the day. Still for 1100 years Western music has been created with a twelve-tone system, and a functional understanding of that system lends a guiding hand to the performing and composing of any style of music the student pursues. A musician plays with head and hands. In lessons at B Sharp Studio the concepts scale, chord, key, and meter are interwoven, and an important understanding of Music Theory is acquired as a student applies it to the music of his or her choosing. A deeper study of Music Theory is possible as a student advances, and it’s value becomes evident as does mastery as a player gains experience. Hands-on experience brings the concepts to the conscious level, while practice makes them second nature. 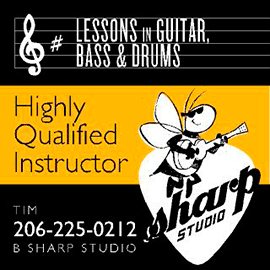 The following musical principles are covered over time in guitar lessons, bass lessons and drum lessons. A single tone, the atom of music, such as the note “C.” A note may serve as part of a melody, one in a string of pearls, as a root or other tone in a scale, or as a tone in a chord. Two or more notes produced simultaneously, whether perceived as pleasing (consonant) or displeasing (dissonant), is harmony. A chord is three or more notes extracted carefully from a scale. A chord is harmony, specific harmony. The every other note rule of harmony applies. Notes “C” “E” and “G” taken from the “A minor scale” form a “C major chord.” A key has 3 minor chords, 3 major chords, and 1 diminished chord that all serve as the chordal inventory of a key. The purpose of a chord is to support the melody. The guitarist strums a progression of chords or “chord progression” while a singer sings the melody. A series of notes arranged in alphabetical order “A B C D E F G” that serve as the tonal inventory of a key; here the key of “A minor.” “Diatonic scale” refers to this 7-note ordered scale. Five notes in addition to the seven natural notes in a scale. The note “A sharp” (written A#) is one fret (half step) higher than “A.” “A flat” (written “Ab”) is one fret lower than “A.” A# and “B flat” (Bb) are enharmonic, i.e. they are same note. The 7 natural notes and the 5 sharps or flats combine to make a chromatic scale, and serve as the pitch inventory of our twelve-tone system. Twelve notes in our system means there are twelve possible roots, twelve minor keys, and twelve major keys. It means there are twelve minor chords, and twelve major chords. Twelve diminished chords, twelve augmented chords, and even twelve Major 9 augment 11 chords. C major C minor C#major C#minor D major D minor D#major D#minor etc. This means that any scale, chord, or song can be played at twelve different pitch levels, and assigned twelve different letter names. Roman Numerals: The diatonic scale may be assigned roman numerals to designate the chords of that scale. Of seven notes in a scale each note serves as a possible root to a chord by the same name. Here in C Major:C D E F G A B / C are the 7 degrees of a scale. The reappearing C is called the octave, and may be called 8 or 1. A more descriptive method is to use small case numerals for minor chords. I ii iii IV V vi viio. Here is seen clearly the I IV and V chords are major, and the ii iii vi chords are minor, and that the o following the vii chord marks it diminished. Now a I vi ii V progression is clearly in a major key. i VII VI VII is clearly in minor. This common progression might be “All Along The Watchtower” or the last section of “Stairway To Heaven,” and A minor is played: Am G F G. In E minor it’s played: Em D C D.
The meter or time signature at the beginning of a piece of music tells the musician how the beat will be organized. In simple meter: 4/4 3/4 2/4 means four, three, and two counts or beats to a measure, or unit of time, and the count and beat are the same. In 4/4 the quarter note is counted: 1 2 3 4. Each beat/ note can be subdivided in two (into 8th notes) and counted: 1+(and) 2+ 3+ 4+. It may be further divided into 16th notes, and each beat is counted: 1e+a, 2e+a, 3e+a, 4e+a. Most pop/rock is in simple meter. These simple meters each have a compound equivalent: 12/8 9/8 6/8 respectively, where the count and beat are different and the subdivision is in three. The beat is a “dotted” quarter note and there are 4 in a measure. The count is 12 and counted: 1 2 3, 4 5 6, 7 8 9, 10 11 12. Note the four groups of three. Irish music is usually in a compound meter giving it a rolling quality. Slow Blues is felt in compound meter. Functions within meter, and is the pulse or feel of the music. Patterns develop and recur, yet an instrument or singer may display great rhythmic fluctuation within the meter as the song and mood develops. composition, which incorporates all of these and more in order to bring songs to life.